For the English footballer, see Trevor Harris (footballer). For the Jamaican journalist and broadcaster, see Trevor Boots Harris. Trevor Harris (born May 31, 1986) is an American professional Canadian football quarterback for the Edmonton Eskimos of the Canadian Football League (CFL). He was signed by the Jacksonville Jaguars as an undrafted free agent in 2010. He played college football at Edinboro University. As Edinboro's starting quarterback, he broke "every career passing record in the Pennsylvania State Athletic Conference" and was a two-time finalist for the Harlon Hill Trophy, awarded each year to the individual selected as the most valuable player in NCAA Division II. Harris was an Ohio all-state selection in both football and basketball at Marion Pleasant High School. He was a three-year starter in football, throwing for 1,523 yards and 23 TD s as a senior, completing 90 of 149 passes with just 7 INTs. He was named the Offensive Back of the Year by the North Central Ohio Football Coaches Association, and was also a first team all-NCOFCA choice. He was also a first team All-Mid Ohio Athletic Conference choice and was named the District 11 Player of the Year. He was an All-Ohio selection as a junior, while also being named first team all-MOAC and All-NCOFCA. He completed his career throwing for 4,439 yards with 59 TDs and 19 INTs, adding 6 TDs rushing. Harris played collegiate football at Edinboro University of Pennsylvania, a member of NCAA Division II's Pennsylvania State Athletic Conference. Early in his sophomore year, he broke the school's single-game passing record, leading the Pittsburgh Post-Gazette to predict, accurately it turned out, that Harris would "rewrite the school's passing records." In 2008, he became the third Edinboro player to be a finalist for the Harlon Hill Trophy, and was a finalist again in 2009. Harris was named to the 2009 Consensus Draft Services Preseason All-American Team. He was the first player to repeat as PSAC West Offensive Player of the Year since Randy McKavish of Slippery Rock won the honor in 1997 and again in 1998. He was a three-time All-PSAC West selection and was the PSAC West Rookie of the Year as a freshman. In his final game at Edinboro, a NCAA playoff game against West Liberty University, Harris set a Division II record with 630 passing yards in a playoff game. West Liberty won the game 84–63, as the two teams combined for 1,394 yards. Harris finished his career with 11,899 yards passing, completing 66% of his passes and throwing for 100 touchdowns. On April 24, 2010, Harris signed with the Jacksonville Jaguars as an undrafted free agent following the 2010 NFL Draft. He was waived from the team following the preseason. On November 12, 2010, Harris was signed by the AFL's Arizona Rattlers. On July 14, 2011, Harris signed with the United Football League's Hartford Colonials. On July 27, 2011, Trevor Harris agreed to terms with the Buffalo Bills. On October 31, 2011, Harris signed with the Orlando Predators of the Arena Football League. On March 29, 2012, Harris signed with the Toronto Argonauts of the Canadian Football League. In the Argonauts second, and final, pre-season game of the 2012 CFL season, Harris threw 13 completions in 15 attempts, for 160 yards and 2 touchdowns. His outstanding performance earned him a spot on the roster. Harris played in two games in the 2012 season completing 8 of 19 throws for 80 yards. Harris continued his strong pre-season play in the first preseason game of the 2013 season; completing 8 of 11 passing attempts for 115 yards. During the 2014 CFL season Harris started in one game, and played in another 5 games. For the entire season he attempted 60 passes, completing 42 of them (70% completion percentage), for 449 passing yards with 2 touchdowns and 1 interception. During the 2015 preseason, the Argos announced that Ricky Ray (incumbent starting QB) would miss the first six games of the regular season as he recovered from a torn rotator cuff injury sustained in the 2014 season. ; Thus making Harris the Argos starting quarterback for Week 1. Trevor Harris started the first 16 games of the CFL season for the Argos as Ricky Ray's injury rehab took longer than expected. During the season, he led the Argos to a record of 9–7 before Ray would start the final two games of the season and the Argos lone playoff game. During his first season as a starting CFL quarterback Harris played admirably. He completed 382 out of 538 pass attempts (71% completion) for 4354 yards with 33 touchdowns and 19 interceptions (both league highs for 2015). Within the first few hours of free-agency starting on February 9, 2016, the Ottawa Redblacks announced that Harris had signed with the team to a two-year contract. He began the season as the backup to Henry Burris who turned 41 years old when the season began. Harris made his Redblacks debut partway through the opening game of the season after Burris injured his finger while receiving the ball from a shotgun snap. Harris completed 17 of 19 passing attempts for 292 yards, with 3 touchdowns and 0 interceptions leading the Redblacks to a dramatic overtime victory over the defending Grey Cup champion Edmonton Eskimos. Following the game, it was announced that Burris would be placed on the 1-game injured list, making Harris the starting quarterback for Week 2. Only a couple days later it was announced that Burris had been transferred to the six-game injured list. Harris was named as a player of the week three times in the month of July, and chosen as the second best player in the month behind teammate wide-receiver Chris Williams. Harris was injured during a July 22 (Week 5) game against the Saskatchewan Roughriders and replaced by back-up Brock Jensen for the rest of the game. The following week (Week 6), Henry Burris returned from his injury as starting quarterback, and Harris was considered week-to-week with knee and ankle injuries. Following their Week 9 loss to the Alouettes, Ottawa Head Coach Rick Campbell announced that Harris would return to the starting lineup for Week 10 against the BC Lions. In his absence the club had lost three of their four games. Harris started in the next six games for the Redblacks but was ultimately unable to meet expectations, only winning two games and losing four. He was subsequently benched again in favour of Henry Burris. Under Burris' leadership the Redblacks went on to win the 104th Grey Cup. Within a week of winning the Grey Cup Redblacks General Manager Marcel Desjardins stated that based on the how the contracts are structured (for Burris and Harris) the team planned for Harris to be their starting quarterback for the 2017 season. Burris retired on January 24, 2017. Harris started the first 12 games of the 2017 season for the Redblacks before leaving the team's Week 12 game against the Hamilton Tiger-Cats after suffering a shoulder injury. A couple days later it was announced by head coach Rick Campbell that Harris would be out at least a couple weeks with a bruised shoulder. Harris concluded the 2017 campaign having set new career highs in completions, attempts and passing yards, leading Ottawa to the playoffs for the third consecutive season. Not long after the season wrapped up the Redblacks and Harris agreed to a one-year contract extension keeping him with the club through the 2018 CFL season. Harris was set to become a free-agent in February 2018 had both sides not been able to come to deal. Harris had his most productive season in 2018, setting new career highs in pass attempts, completions, and yards. In the Redblacks' East Final playoff game against the Tiger-Cats, Harris set a new CFL record for most passing touchdowns in a single playoff game with six. He completed 29 of 32 pass attempts for 367 yards, leading the Redblacks to their third Grey Cup appearance in four years. However, Harris and the Redblacks were bested in the 106th Grey Cup by the Calgary Stampeders. On February 12, 2019, it was announced that Harris had signed with the Edmonton Eskimos. ^ Lisa Byers (2009-11-14). "Harris takes over all-time honours at Terwilliger's old house". The Meadville Tribune. ^ Phil Axelrod (2007-10-10). "District Spotlight – Harris-led Edinboro lives by the pass". Pittsburgh Post-Gazette. ^ John Dudley (2009-11-22). "Edinboro, Harris lose in shootout to West Liberty, 83–64". Erie Times-News. Retrieved 2010-04-30. ^ "Trevor Harris profile". Draft Countdown. Archived from the original on 2010-04-24. Retrieved 2010-04-30. ^ "Harris headed to Jaguars". The Meadville Tribune. 2010-04-25. ^ "NFL: Jaguars sign 17 undrafted rookies, including QB". Honolulu Advertiser. ^ Rush, Curtis (Jun 16, 2015). "The No. 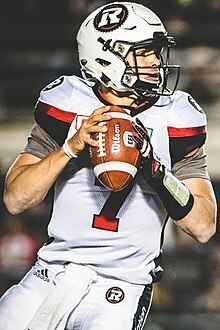 1 quarterbacking duties fall to Trevor Harris, a player with only one CFL start under his belt". The Toronto Star. ISSN 0319-0781. Retrieved 2015-06-17. ^ "Capital Gain: REDBLACKS reportedly sign Trevor Harris". CFL.ca. Retrieved 2016-02-09. ^ "Redblacks quarterback Trevor Harris leads Ottawa to thrilling win over Eskimos in CFL season opener". Ottawa Sun. Retrieved 2016-06-27. ^ "Injured hand to sideline Henry Burris for next Redblacks game". 2016-06-27. Retrieved 2016-06-27. ^ "Report: REDBLACKS place Henry Burris on six-game injured list". CFL.ca. 2016-06-29. Retrieved 2016-06-30. ^ "Chris Wiliams and Trevor Harris Named CFL Top Players of July". Ottawa REDBLACKS. 2016-08-03. Retrieved 2016-08-08. ^ "Roughriders rally to 1st win of the season over Redblacks". The Canadian Press. CBC News. 23 July 2016. Retrieved 23 July 2016. ^ "REDBLACKS confirm Burris to start Week 6 vs. Argos". CFL.ca. 2016-07-27. Retrieved 2016-08-08. ^ "REDBLACKS announce Trevor Harris to start in Week 10". CFL.ca. 2016-08-21. Retrieved 2016-08-21. ^ "Ottawa Redblacks quarterback Trevor Harris not sulking over demotion". Ottawa Sun. Retrieved 2016-11-01. ^ "Henry Burris earns legendary status with Grey Cup win". CBC Sports. Retrieved 2016-11-30. ^ "Hank Hangs 'Em Up: Burris confirms retirement after 18 seasons". CFL.ca. 2017-01-24. Retrieved 2017-01-24. ^ "Redblacks' Harris leaves with apparent shoulder injury – Article – TSN". TSN. 2017-09-09. Retrieved 2017-09-11. ^ "Campbell says Harris' shoulder injury will keep him out "weeks" – CFL.ca". CFL.ca. 2017-09-09. Retrieved 2017-09-11. ^ "Redblacks re-sign QB Harris for 2018 season – Article – TSN". TSN. 2017-12-13. Retrieved 2017-12-14. ^ "Trevor Harris sets playoff record with sixth TD pass – CFL.ca". CFL.ca. 2018-11-18. Retrieved 2018-11-19. ^ "2018-11-25 Game Tracker – Ottawa Redblacks vs. Calgary Stampeders (2551) – CFL.ca". CFL.ca. Retrieved 2018-11-30. ^ "Eskimo Sign Quarterback Trevor Harris". Wikimedia Commons has media related to Trevor Harris. This page was last edited on 5 March 2019, at 20:40 (UTC).